There were 274 press releases posted in the last 24 hours and 153,596 in the last 365 days. Durango is obtaining quotes for an Induced Polarization (IP) survey on its wholly owned Trove property at Windfall Lake, Q.C. VANCOUVER, BC, CANADA, February 19, 2019 /EINPresswire.com/ -- Durango Resources Inc. (TSX.V-DGO) (OTCQB-ATOXF) (Frankfurt – 86A1), (the “Company” or “Durango”) is pleased to report that it is obtaining quotes for an Induced Polarization (“IP”) survey on its wholly owned Trove property at Windfall Lake, Québec. The Rouleau and Barry fault systems bisect Durango’s Trove property and continue northeast and run through to the Windfall Lake gold camp. The Trove property is surrounded by Osisko Mining Inc. (TSX-OSK) and covers the same main fault system as held by Osisko. The Trove property is wholly owned by Durango and the Company is looking to define the current drill targets by conducting IP on approximately 70 hectares of the property where gold anomalies in the till occur along the trace of the fault. 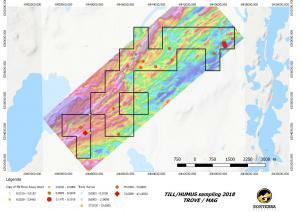 Currently, four (4) drill targets have been delineated on the Trove property and two of these targets are in swampy areas which require winter exploration. Durango plans to complete the IP survey in the upcoming weeks to fast-track the exploration drill target definition.